The Witches Ladder is like a rosary. It is devised for counting without diverting one's attention. 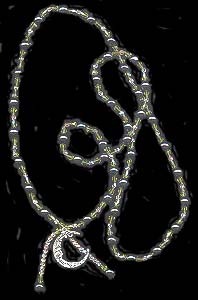 It's traditional 40 beads are used for straightforward auto suggestion. A must for serious spellwork. All Witches Ladders come with complete instructions. Each ladder is one of a kind. Handmade by Lady Mimi. The items below may or may not be in stock so we invite you to call and check on availability. 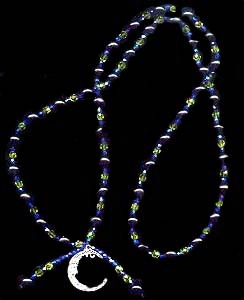 Cobalt blue and peridot green glass beads with pewter crescent moon charm. Very heavy and awesome! 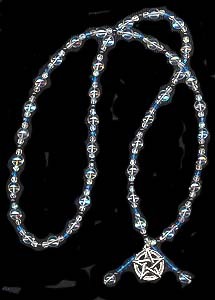 This Witches Ladder is made of deep purple, haemetite and irridescent blue glass beads with a pewter pentacle charm. Very heavy and awesome! 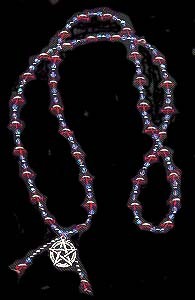 This Witches Ladder is made of red, periwinkle irridescent and haemetite glass beads with a pewter pentacle charm. Very heavy and awesome! This Witches Ladder is made of haemetite, peridot green and irridescent pink glass beads with a crescent moon pewter charm. Very heavy and awesome! 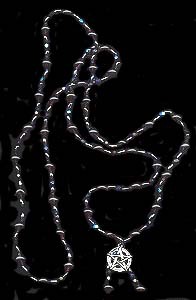 This Witches Ladder irridescent clear, blue and black glass beads with a pewter pentacle charm. This one is just magnificent!